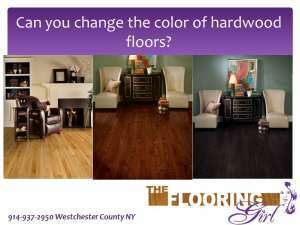 Hardwood flooring - Can you change the color of your hardwood floors? Hardwood flooring – Can you change the color of your hardwood floors? The answer is usually YES! Many homeowners don’t realize that you can change the color of hardwood flooring when you refinish your floors. Yes, it’s true…you can go light or dark or red tones or anywhere in between. Most are pleasantly surprised it doesn’t matter if you are going light to dark or vice versa. First, let me caveat this by mentioning that I’m assuming you can sand and refinish your hardwood floors. Most homes in Westchester NY and Fairfield CT as well as the Northeast and Mid Atlantic tend to have solid hardwood flooring and solid hardwood can be sanded and refinished many times (unless it’s so old that the floors have worn down to the tongue and groove…note, this usually takes many generations and I’ve seen hundreds if not thousands of hardwood floors and I believe only twice they were too old and thin to refinish). So most solid hardwood floors can be refinished. 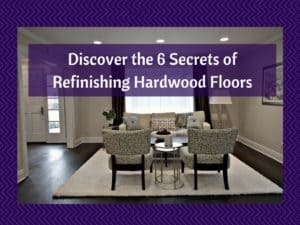 If, however, you have engineered hardwood, you may or may not be able to refinish the hardwood – it depends on how thick the top layer of hardwood is and how the wood is installed (floating floors can not be sanded). 1. First, you sand the floors with sanding machine. We typically do 3 sandings, each with finer grits (the grits vary based on the type of wood and age). This ensures your hardwood is smooth and that it properly accepts the stain and/or polyurethane for a better and longer lasting look. When you do this, the wood essentially looks like new raw hardwood. 2. Step 2 is to add a stain...or if you decide to go “natural,” you jump to the next step. You can choose a light stain such as Golden oak or Golden Pecan, or a dark stain such as Ebony, Jacobean, dark walnut or Royal Mahogany. Or, you can choose a mid color stain such as Provincial or Special Walnut or English Chestnut. You can also choose red tones such as as Red Mahogany or Mesquite Red or Sedona red, or a bit lighter with Gunstock. For a full range of stain colors, check Minwax.com or Duraseal.com. For my customers, I help them select stain colors and my guys will test 3-4 for them on their own floors. This is important first because every floor is different based on the species, grade of wood and age of wood. Further, wood is a natural product and there is color variation – the wood will accept the stain differently, so testing on one piece or looking at a stain chip is irrelevant. You want to look at it on your own floor and see over a wider space of several boards before finalizing. Please note that testing the stains does not damage your floors or wear them down any further…they will still get 2 more sandings. 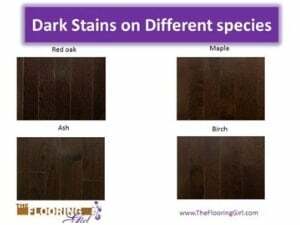 This slide demonstrates how the same stain can come out different on different species of wood. This is a pre-finished floor using a custom color called mocha. The color and graining difference is a bit more dramatic in person, but this slide helps demonstrate the difference. This is mocha on red oak, maple, ash and birch. 3. The third step is to add polyurethane – usually 2-3 coats. Assuming you are using oil based polyurethane it takes 24 hrs for each coat to dry and you screen (or buff) the floors after the 2nd coat is applied and in between each additional coat. This helps smooth the floors and importantly helps the polyurethane absorb better and last longer. (for more info on oil based polyurethane vs. water based polyurethane). For the polyurethane, you want to select the type of finish or sheen that you prefer – matte, satin, semi gloss or glossy. Currently, satin is the most stylish and probably 90% select this option. A satin finish tends to show the scratches less than a semi gloss or glossy finish (the glossier you go, the more the light reflects to show the dents and scratches). How light can you go with hardwood? Well this depends on what type of hardwood you have. Aside from bleaching/white wash finishes, the lightest you can go is natural (i.e. no stain), so it’s the color of the hardwood with the polyurethane (which is a clear coat with a touch of tint…it’s pretty close to the impact that putting a top coat of clear nail polish has). 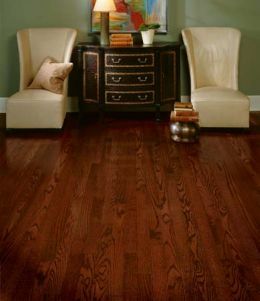 Most homes have oak flooring and to the left is a picture of red oak hardwood natural – with no stain. If you have white oak, it will be a bit darker (because white oak is a bit darker than red oak – for more info on red oak vs. white oak hardwood). If you have maple, it will be a bit lighter; if you have pine, it will be a bit darker (and perhaps a bit redder pending on the species of pine). If you have Walnut or Brazilian walnut, it will be much darker as this wood is a dark brown, or likewise if you have American Cherry or Brazilian Cherry, this will be redder/more orange as that is the natural color of the wood. But, most homes in Westchester NY and Northeast/Mid Atlantic have oak. The only way to get the wood lighter than its natural color is to bleach it or use a white wash stain. I’m not a huge fan of these both because the color often reacts with these oils and resins on these woods and doesn’t usually look the way customers expect and can become blotchy on non-oak woods. You also need to use a water based poly. See oil vs water poly for info on the differences and recommendation on brands of poly to use. Please note that you MUST SAND the floors in order to change the color of the hardwood floors. You can not just add stain or paint on top of finished floors…it will not look good and it will not last…it will peel off. And, yes, I have seen this done before and it looks horrible, so don’t even try it. You can find the full video transcript at the bottom of the page. Should you replace or refinish your hardwood floors? Hi my name is Debbie Gartner and I’m known as The Flooring Girl, and you can find me at TheFlooringGirl.com. 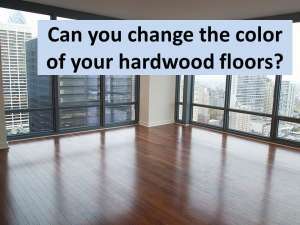 Today, I’m going to answer the question about whether or not you can change the color of your hardwood floors. The good news is the answer is usually yes! Of course this assumes that you have solid hardwood. 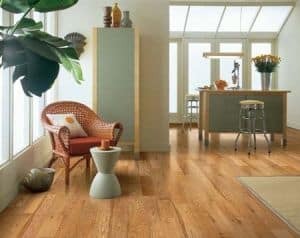 If you live in Westchester or the New York area or even the northeast and mid-atlantic, and you live in a house, chances are you have solid hardwood. If you engineered hardwood floors, that’s a different story. With solid hardwood you usually can refinish them. You may have a different species, but usually they are solid and you can refinish them. We have refinished hardwood in houses from the 1800s and even several from the 1700s. These pictures show the range of colors that you can get on oak. If you look at that one on the left this is oak natural with no stain just polyurethane. The one in the middle is a red mahogany stain, and the one on the right is with an ebony stain (although typically in real life the ebony stain looks a little bit lighter and shows the graining a little bit more than this photo leads you to believe). This is why it’s really important to test the stain colors as they are different in the pictures than it looks in real light. And, the stain colors do you actually look different on everyone’s floors. That can vary based on the species, is it red oak or white oak, what grade as well as how old the floors how much have they aged as well as the lighting. We always test three or four different stain colors for our customers so they can choose. As you can see in these pictures some of the planks are lighter some are darker the stain will be absorbed differently, and you want to test on a small area to see what works best on your floor. Please note that the only way to change the color is to actually SAND the floor all the way down. When you see sand them three times finer and finer grits and the raw hardwood but that’s the only way have the stain up properly penetrate into the floor. If you try to do it on top of what you have now it will peel off. If you have some other species, the colors will look different. 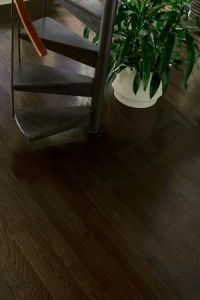 In particular if you have brazilian cherry or brazilian walnut or some of the exotic hardwoods those start out darker and many of them have a red natural tone underneath. So those you really can’t make lighter than they are. If you look at the one on the right, that is Brazilian cherry. There’s no stain on it; just polyurethane. If you see sand and refinish it, it will look a little bit lighter than this just from the sanding, but over time the light and the Natural aging process it will look just as this does right now. The one on the left is Brazilian walnut and obviously that’s a darker brown. You can make those darker, but you really can’t make them lighter. This here is an example one of my customers where she had Santos Mahogany which is is very similar to the Brazilian cherry. She did not like redness in there. (She is not alone in this), and she wanted us to drown it out as much as possible. So we tested out some darker stains. And, as you can see in the picture on the right (even though it’s not the best picture), this is the end result. We tested a few different stains and found that on her floor, dark walnut came out the darkest. This is kind of ironic because Jacobean and and ebony are darker stains but they are absorbed differently in each wood. In this case, the dark walnut looks darker. This does a good job drowning out the red but there’s still are some underlying red tones, if you look close enough. This looks more like a royal mahogany stain but this is really the best that you can do to try to drown this out. Need help with hardwood floors turning red no matter what kind of stain or finish I use. Even used polyurathane and it turned red. Please help. It would be greatly appreciated. Francis – What type of wood do you have? Maybe you have brazilian cherry or some sort of cherry that is naturally red. Usually, a dark stain (e.g. ebony or jacobean) will drown out the redness. I hope that helps. We have bleached our white oak hardwoods twice and got a very yellow outcome. My finisher was very pushy to stain and seal even though I was not happy at this point can I sand back to the origins color? Can I sand and bleach the yellow out? Is all hope lost? Bernadette – As long as you have solid hardwood, yes, you can sand it all out and start all over again. BTW, there may be several reasons it’s yellow. It could be the species of wood, bleach not applied properly (less likely), oil based poly or cheap water borne poly). It could also be unrealistic expectations on color (i.e. wood naturally has some yellow). This often happens with white washed floors, especially on existing wood that has aged. People often have a whiter color in their head, and it’s just super hard to achieve on site finished woods. But, if you’re not happy with it, start all over again and change directions (e.g. do standard colors). They are new white oak hardwoods and we used bona natural seal after the bleaching and staining, then bona traffic hd satin poly. I really believe he didn’t wait long enough after the bleaching before he stained and sealed. 1st bleaching was done in the late afternoon, then he came back the next morning to screen and bleach again. Later that day he screened and stained. Bernadette – first, you shouldn’t be bleaching white oak floors…that generally makes them yellowish due to the reaction in the wood. You would use bleach on red oak to drown out the pink. Also, you can double bleach floors, but you would 24 hrs between each coat…but as I said, bleaching is not the right thing to do here. Also, you don’t screen after the stain…you screen after the poly. Also, the natural seal probably has a bit of yellow. Nordic seal is the lightest/least tinted…closest to a natural look. But, you don’t need a seal after the stain. You would probably want to start fresh…and maybe consider using a different installer and/or go with a more traditional stain. It’s also very possible that I’m misunderstanding what was done. Buying our first home and the previous owners installed engineered oak floor two years ago, that seems yellow/orange and has really busy black grain pattern that drives me nuts. It looks like crazy tiger strips all over the floor. Do you suggest we stain darker to help get rid of the black grain pattern/contrast? If you don’t have leftovers, try contacting original owners to see if they can help. Or if you have registers in the floor, you can lift them to get a side view. Please note that if the floors are floated, you may not be able to refinish at all, especially if floor is uneven and/or moves. But, if you can refinish, then most likely going darker will hide the graining. I would check w/ a local flooring expert as you do want to look at the species of wood. If it’s oak, for example, going very dark or very light will show less graining. I have a flooring team that just (today) sanded my reclaimed oak. He put some stain in a couple of areas (oil based poly, chestnut, and medium brown). What I really like is somewhere between the poly and chestnut but he says those are my only options. He also said that he doesn’t like to use water based poly because it’s not as good for the floor, while the other flooring guy with whom he is working wants to use water based. So, I need to make the call soon. What would you do? Hi Dee. First, there is an option to blend stain colors. You could do a 50/50 blend. It’s generally ideal to use a standard color in case you want to match other rooms later or if you only need to refinish some rooms. There may also be some similar colors to the ones you chose – look at duraseal and minwax colors. I definitely would not do a water based stain. Those do not come out very well and often look blotchy. That’s different from what I wrote about on oil vs. water based poly. There is the stain – the color…and then the poly goes on top. Typically you use a stain w/ oil and then either water or oil based poly. Personally, I would do oil on both as it should come out better visually and last longer. I have two different types of hardwood in my home. One area light, the other dark. Can sanding them down and staining one color make them match? Rutrow – This is challenging to answer without seeing it. If they are in fact 2 different species of wood, they will come out different. If it is one species, but 2 different stain colors, they should turn out the same. More often than not, wood matches each other, especially if it was all installed at the same time. We have light hardwoods in our house. they are made of natural hard rock maple and not stained but sealed. For some reason in the dining room in some areas the wood is turning dark.We put them in 4 years ago. why is this happening and what can we do about it? Esta – It’s challenging to say without seeing it, but the most likely reason is that the poly has worn off and now they are absorbing some water (perhaps just from everyday cleaning). You may have a water based poly (which doesn’t last as long, and it’s possible that there is a lot of scratching from movement of the chairs. That’s my best guess. You may need to sand & refinish the floors. I would recommend calling in someone local to give you an opinion as they can give you better advice after seeing it in person. We are buying a new home and the floors are maple with Brazilian cherry border around the perimeter. We’re having the floors refinished and I’d like to have them stained yet the Internet cautions against restraining maple. I’m hoping for a medium brown, something a little more contemporary than the light maple. Any tips? From what I’ve read here, you recommend oil vs water unless we stay natural color with maple. Thanks! Drina – Yes, you can stain maple. It’s just more challenging and more expensive…AND, importantly, you need to have a refinisher who is experienced with maple. They need to use a conditioner, too. Maple turns out “blotchy” due to the wood itself, so make sure you check out some samples in stores to make sure you like the look. Also, be aware that the stain color all come out different on maple then on oak, so test, test, test. Many of the browns turn out with a bit of gray (which actually can look nice). Regarding the poly, use water borne if natural, but if you do a stain, you can use either water or oil. Oil will make it look more yellow, so I would also test this…it will look different based on the stain color you use. If you use water, go for Bona Traffic HD which is the best. For oil, use Duraseal. But definitely test to see what you like. I would normally tell you to test out gray for an updated look (and it’s easier to get a nice looking gray on maple). But, the gray won’t work well on brazilian cherry. BTW, this reminds me of a really nice home I saw 4 or 5 years ago with that same combo of colors. We recently installed an engineered wood with a matte finish. I have found that I LOVE the color- but I see footprints as soon as anyone walks across it. Would changing the finish (not the color) from matte to something glossier help? …And can I even DO that with engineered wood? I’m not sure if finish would change it. It may be due to the type of wood you have. Some of the exotic woods are oily and do that. Usually matte shows prints the least. Are you sure it’s a matte finish? You could try a screen & recoat…which can generally work on engineered wood, as long as it’s not floated. A simpler solution may be to wear socks. I redid the hard wood floors in my house. The bed rooms have white oak and hallway livingroom and dinning room have red oak we tested minwax cherry 235 stain and liked it but when we put the first coat on it came out very red on the red oak. I have not put poly down or anything yet. Is there anything i can do to make that red more brown? I have heard about tinted poly and mixing a little bit of a darker stain in with the first coat of poly but i dont want to try it and make it worse! Yes, I’m not surprised it’s coming out more red on the red oak. Obviously the best approach is to resand the floors and retest/start again, but I understand you may not want to do this. You can try a tint to make it a bit darker and browner. This is better than adding a 2nd coat of stain as that will not properly absorb and then the poly will not properly adhere on top of it. You can try the tint, but you still may not be happy and then may need to go back to the drawing board anyway. Try to test in a closet, if there is one. Very interesting article. It sounds complicated work. My advice is to call a professional service if you are not sure what are you doing. Greetings! Bertha – Thx. Yes, sanding is best done by the professionals. There is no contest on looks and durability. and, the money saved by trying it yourself is minimal. Esther – If you have beech hardwood (i.e. the species), you can’t change it to oak. Beech is not really a color (or at least I haven’t seen it). But, if you have solid Beech (or solid wood), you can change the color by sanding it and staining it. After power sanding my Strand Bamboo flooring, i noticed after appllying 3 coats of oil base poly..all the boards ends are lighter than the rest of the floor..Whats up with that?? Bill – I don’t believe strand woven bamboo is meant to be sanded. In addition, I believe you are supposed to use water borne poly with it. I would call the manufacturer. But, honestly, bamboo is not meant to be sanded and all and when you have the types that can be sanded, it generally does not hold up well – maybe it will last for a year or so. I would call the manufacturer. We had 1000 sq ft of red birch clear hardwood flooring installed when we built our house 10 yrs ago. I’m interested in staining them darker, but all of the websites that I’ve read state that birch doesn’t stain well. Which type of stain would work best? What are your thoughts on the hardwood oils such as Rubio Monocoat? Yes, birch (as well as maple) do not absorb stains well – they come out blotchy no matter what you do. That’s because it’s a closed pore wood. It helps if you add a conditioner to open up the pores. Darker stains tend to show it more than lighter stains. I might look in a store to see what you like – you can look at birch or maple as they come out pretty similar. And, you’ll see the blotchiness on the prefinished ones so it will guide you. Note: the stains will come out different on birch/maple vs oak, so you need to test and see what you prefer. Many of the darker stains turn out grayish on maple and birch (which actually looks pretty cool). Re: oil poly vs monocoat, that’s the top layer. Monocoat tends to give a more “old world” look. I am not sure how they would look on birch. Thank you for your quick response. I was afraid you were going to tell me that. You mentioned using a wood conditioner, would water popping the grain work better? I just had a really nice matte coffee colored oak engineered hardwood floor put in my new condo. Much to my surprise, many of the planks have very strong red undertones (which I am very much not a fan of). Is there a way to cover up the red? Thanks in advance! Matt – It’s really hard to answer this question without knowing the wood or thickness of top layer or way it was installed. Most likely, no, there is probably very little you can do. Many/most engineered hardwood floors can not be refinished (as this would be the way to change the color). 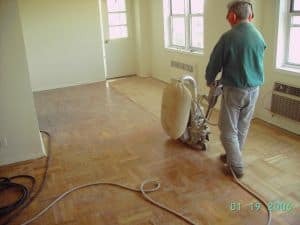 If the floors are floating, you won’t be able to refinish them at all as they will move with the sanding machines on top. It is odd, though, that if you got a matte coffee colored oak that you are seeing lots of red boards. You may want to go back to the manufacturer and see if they sent defective batch and/or if their samples were misleading. Whoops! Posted too soon.. Anyway, is there anything I can or should do? Have him come back & red and? Find a stain and try to blend? I’m just at a total loss but this can’t be acceptable?! Mallory – That is odd. I’ve never heard of stain on some areas having such an impact. However, I have seen the impact of carpet (and area rugs) and vinyl having a big impact as the light has penetrated the floors less in these areas. Pine is a bit more sensitive to light than oak + it’s often been there longer so more time for aging due to light (or lack thereof). I am not sure what to advise you on this, especially as I can’t see it. I would recommend you contact the installers and get their advice as they can see it and provide better solutions. My inclination would have been area rugs to cover. I have a hunch doing another stain in that area will look worse vs what you already have. Thanks for the response. I did contact him & he said there are not many options… One would be to stain as dark as possible but I think that would look terrible in an already dark, old house. Plus, all of our windows, baseboards, doors, stairs, etc are a beautifully stained SYP wood… OR to tint a poly & brush it onto the lighter, already poly-finished area to try to darken it?? This makes me nervous but I don’t know what else to really do. Wish I could show you a photo of how crazy it looks! Thanks again! Wish me luck! We just had our oak floors sanded while we where gone when we got back home they had stained with Natural oak stain and does not match the rest of our house is there any way to darken the floors without sanding them again they did not put any polyurethane as out hose is on pear & beam and does get moisture under it. Bart – This depends on how close the colors are. If the new area is a bit lighter, they may be able to do a screen & recoat where they add another coat of poly and add a tint to it to darken it. Also, it may just be the newly sanded area needs time to age and catch up to the older areas. Hope this helps. I had my floors sanded & stained Ebony on Red Oak floors. It didn’t come out as dark as I wanted it. Can I Just restain with another coat? or do you think adding Poly will darken it? it’s been 2 weeks since I last stained, do I need to water pop on top of the already Ebony stain? Nisha – Honestly, the best thing to do is start over and maybe try out True Ebony (a darker stain) or mix this with ebony. It’s not a good practice to do 2 coats of stain as it won’t adhere properly and your floors won’t last as long. Further, I have no idea the impact of waiting 2 weeks. Most likely dust has settled in. This would obviously need to be wiped off, but it will make it harder for it to adhere. Alternatively, just add the coats of poly (it will get a tad darker) and on the 3rd coat, add an ebony tint to make it a bit darker. Do not add the tint for the 1st or 2nd coat. Enjoyed reading your site. Alot of information. What is your recommendation for inlay floors. We bought a house with different designs in each room. Looks to be oak with a Brazilian cherry inlay. The oak is now looking more orangish. If we have it refinished to modernize it, any suggestions how to keep inlay but change stain. Thanks so much. If the inlay is a different species, that it will still stay there as you refinish the floor. Generally, lighter colors will show the most contrast and darker the least, so it depends on your preference. Definitely test stains and test some in the area that has the inlay. Our first level floors are to be sanded and restained, due to a leak in our foyer. Would it be appropriate to stain them a bit darker, even though the stair runs and 2nd level are a medium oak? My heart really would like darker, my head is telling me no?? I would love your suggestion! Hi Paula. In general, I always recommend that people go with their gut and go with what they love. I think it’s ideal to have the same color on the same floor/level and it’s fine to change by level. I see many homes that are darker on 1st level (it gives it a more contemporary look) and a bit lighter on upper floors. Often, upper floors have less light than 1st floor (which has more open space), so it works for that reason as well. What color stain is in #3 above? Love it! Alyssa – I’m glad you really like it, but I’m not sure which item you are referring to. If you mean the ones my guy is testing, to be honest I can’t remember as it was several years ago and it was a mix of colors. Hi David. Your 2 basic options are 1) replace sections of wood/weave in, or 2) choose a dark stain to camouflage (e.g. ebony, jacobean, dark walnut). Please note that if you camouflage, it will just change the color; it will not solve any gaps you may have in the wood. Also, I don’t know your definition of an old house, but here in NY, we have many from the 1920’s and before and often these homes have Douglas fir or some sort of pine. They can be a bit more challenging to find matches for and often are milled in different widths now, so you often need an expert to mill/cut the wood. And, bear in mind that new wood is often lighter than old wood, esp with pines which tend to be more light sensitive and have often been in place for 100+ years. Possibly purchasing a house with floors that were recently covered with carpet for a looong time. The house flipper ran out of money and stained the hardwood floors poorly and had no shine at all. I imagine that the floors may have had pet stains and they tried to cover them up cheaply without having the floors resanded and sealed. Will this staining the previous owner put down come up after resurfacing (hopefully)? If the previous owner was covering up pet stains, will staining it professionally and poly coating it resuscitate the hardwood floors? What does something like this cost? This is a 50’s era house (1400 sq ft) in San Diego (no idea what kind of hardwood). Hi Damon – Assuming you have solid hardwood, then when you sand and refinish, the stain will come up and you will have fresh wood. From there, you can either leave it natural or add a stain. However, if there are pet stains there, those probably will not come out and you may either need to do a stain dark enough to cover them or weave in new wood to those areas (if you want to go light). Regarding cost, it varies by area, as well as whether you want natural or stain, number of coats of poly, type of poly. You’ll want to call someone local to get estimates (or ranges). Hi Debbie, Love your site – very informative. I’ve got a craftsman style, contemporary home with Brazilian cherry floors. I don’t like the reddish color, but both of the hardwood floor companies I spoke with did not advise staining them because they said the red would not go away, and they might turn ‘burgundy’ in color. Is this your understanding? My only other option would be to remove the current floors and put down new wood. I’m wondering if you could tell me the difference between white oak and mediterranean French oak (which the hardwood guys had suggested was popular). Finally, I don’t want to go with anything that will go out of style since I’ll likely be selling my home in 5 years – hence, I’m reluctant to go with blond woods or white washed. I also don’t want to go black/ebony dark for the same reason. Do you think the grey wood is likely to be a ‘fad’? Of all the floors you work with, do you have a favorite, or one that you think is the most popular for higher end homes? Thank you! Susan – First, we have used dark walnut to drown out most of the red in brazilian cherry. I think I have a picture of that somewhere on my site, but I’m not sure. It looks like the stain color royal mahogany. Re: replacing your floors, I probably wouldn’t do that if you are going to sell in 5 yrs. You won’t get your money back. I’d refinish instead. If you do change it, I’d probably do white oak with a mid toned brown stain or a bit darker (e.g. special walnut or coffee brown or antique brown) to be popular and neutral. I definitely wouldn’t do gray if you are going to sell (unless you want to refinish again before selling). Gray it very trendy. Yes, it may go out of style by the time you sell, but regardless, only a small percentage like gray for hardwood. Instead so something with broader appeal in the brown tones. You can decide how light/dark brown based on your tastes and preferences. I love the website, it is super informative and helpful. We recently had solid white oak floors installed and we decided to do a natural clear finish on them. We used a water-based duraseal polyurethane (Dura Clear max) and it seems to be a bit more yellow than we expected. They used the duraseal sealer first and then the polyurethane. Is this product truly clear or is it a bit yellow? We thought it would be more clear. What would you suggest we do? Do we have to sand it all down to get a true clear with another product or can we have it screened and recoated with a different product? Do you have any suggestion on what products are truly clear? Trent – No poly is clear. But, Bona Traffic seems to be the highest grade in terms of durability and least amount of amberizing. Unfortunately, the only way to really change the color of the poly is to sand it off and start again. I suppose it’s possible to do a screen & recoat to take the top coat off and put on Bona Traffic, but I’m not sure that you will see much of a color difference. The amber color may be in the sealer. I suppose that you could test it in a closet or something. Hi! Love your site. We have hardwood oak floors in entry, dining area and kitchen all as you enter the house. Our living room, hallway and 3 bedrooms are carpet. We have ripped up the carpet and will be putting in laminate flooring (which I never wanted to do but cannot afford hardwood throughout) so we picked a very nice looking and durable laminate. The hardwood is red oak we believe. Needs some TLC but in very good condition. It came with the house and we have never given it any special care. It’s a very nice floor but not our style at all. We are wondering if it’s possible to sand and restain the hardwood to look more like the color of the laminate flooring we will be putting in? We are getting Pergo XP River bend oak laminate for the rest of the house and not sure what to do with our current floors we have and plan to keep. I refuse to rip them out and replace with laminate! It is a beautiful floor but very 80’s oak looking. Concerned about the transition between the original hardwood and new laminate looking strange. I love the color of the laminate but not our real oak floors. Any ideas welcome!! Thank you. Yes, assuming you have solid hardwood, then you can refinish the floors. However, I think you will have a difficult time matching the laminate you selected. You may be better off contrasting with the laminate (e.g. do a dark stain). Later, I would replace the laminate with real hardwood floors and stain to match the real wood. I have a red wood floor at my apartment and I would like to make it lighter to go with my white walls. However I started sanding and all ,I can see that it’s lighter than before but we got tested it with water and I can already see that if I gloss it , the wood will be darker than when it’s dried. How do I make my red wood stay lighter shade? Tatim – In general, the lightest you can go (wo/a stain/bleaching) is natural (i.e. no stain) and a water based poly (I’d recommend Bona Traffic). Yes, it will be darker than the raw wood). Beyond that, you could try a whitewash or bleaching or both, but I certainly would not attempt to do this on your own. These are hard to work with, so I’d recommend you call a professional. Note: whitewash on red oak (wo/ a bleach) generally doesn’t turn out very well if you have red oak. Note: When you say red floor, I don’t know if you mean you have a red oak or a red species (e.g. brazilian cherry) or an oak w/ a red stain. If you have Brazilian cherry or something similar, you won’t be able to get it very light (unless you rip up the wood and replace it). I hope this makes sense. i have old birch flooring that got sanded yesterday and I don’t like the natural orange look after you just top coat it. We tried a blue stain in the closet and it looks really blotchy. i want it to look light & on the white grey side, not orange tones. Help! Oh gosh. You probably want to call in some professionals. First, are you sure you have birch? Birch is not very common for wood floors. And, birch doesn’t generally turn out orange…it’s light and colored like maple. That being said, when if either maple or birch are old, they darken so you may be getting more of a yellowish/amber look. Now, the next question is what type of poly you are using. If you are using oil based poly, it will turn it more yellowish, and you generally don’t use oil based poly on either maple of birch. Instead, you want to use water borne poly such as Bona Traffic (see my blog post on oil vs water based poly as well as my recent article on brands of poly. This will give you the lightest and least yellow. Alternatively, you add a stain to darken. Please note that both birch and maple are closed pore woods. They are very challenging to refinish, and they will turn out blotchy with a stain. If you are doing this yourself, I would seriously reconsider. I’m not sure why you added blue stain. It sounds like an odd choice (except maybe you were doing to try to cancel out the orange as they are complementary on the color wheel, but that not really how staining works. Also if you do have blue, chances are it’s a water based stain and those are VERY challenging and time consuming to use. If you already added stain and/or top coat, you will need to start again and do a full sand and refinish. If you want to go on white grey side, see my article on refinishing gray. You use a mix of white and ebony. I would make sure to hire someone who has a lot of experience in refinishing maple/birch as well as refinishing gray. I get tons of calls from across the country on botched gray jobs. My floors were stained and coated with a top coat. It was stained to have two tones. One area is light and i want to re do it. Can I sand that area and re-do it. Gemra – Yes, you can resand it and start from scratch and then change the color (provided of course it’s solid wood/thick enough to resand). Once the area is sanded and is bare wood, you can change the color to whichever color you prefer. Thank you for all this great info! I have a hundred year old pine floor. Just been sanded. I wanted to go with a natural weathered gray. Something the pine would naturally weather to if left out side. Don’t want any more yellow. After two days of mixing and testing I’m stilll at a loss. I’ll wix the ebony and white with natural but on the pine a green tint comes up. What can I do to cancel out the green? Or what would be a good color for pine to naturally go to? Instead, try a more traditional color. Dark (e.g. 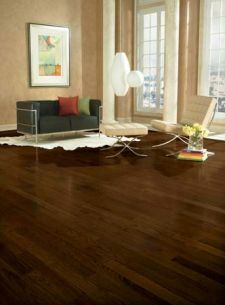 dark walnut, antique brown) tends to work well and is stylish. Thank you, such a quick response! I did just that went with medium dark brown with a hint of gray. It tamed the yellow nicely. Wanting to keep yellow or worse yet green out of the picture I have opted for a water based poly. But my contractor is practically begging me to go with oli based. I rather live with a floor finish that wears out sooner rather than turning yellow green. What are your thoughts, water vs oil poly? Oh gosh, this is a tricky one as I can’t see your floors. If it has a lot of gray, you have no choice but to use water borne and I would strongly recommend Bona Traffic. But, if it is just a hint of gray, you can probably do either. If your floors are old and have lots of gaps and imperfections, oil is probably the better choice. And, as long as it’s dark enough, the yellowing shouldn’t be a factor. I hope this helps, but it’s really hard to tell for your sure since I can’t see your floors. Great Blog! I seen your blog post about not to use a poly oil finish on gray colors. However, I like the benefits of using an oil finish over a water based finish as I lark the dark richness an oil finish will bring to the stain. I will be using the Graphite color bona dri fast stain on red oak floors it’s called Graphite so I’m assuming it will have Gray undertones even though the sample my contractor put down looks more black (ebony) and dark brown; our desired colors. My concern is using the bona woodline poly oil finish which will already have an amber yellow color to it. Even though the graphite is a very dark color black/brown color will the grey undertones be affected by the poly oil finish and become much more amber and yellow overtime? As of right now the sample looks very nice and is our desired color but I’m worried because technically the graphite does have gray in it, but the gray is not very obvious. This is really a judgment call. If the floor is very dark, you probably won’t notice the amber in it. Yes, it will get a bit more amber over time, but if it’s very dark, you probably won’t notice it. We did an oil based poly once on a dark brown with a touch of gray and it looked awesome. Yours may be a bit more gray than the one did. It is a judgment call for sure. Great information Debbie! Learned a lot – I didn’t realize that you can change the color of hardwood flooring when you refinish your floors. Dan – Thanks so much. You are not alone. Many don’t realize they change the color (and sheen) of their hardwood flooring. Thanks for stopping by. Hi there! Interesting blog! I was wondering whether you have any tips for how to apply more fun colors to a floor. We are having a new red oak floor put in, and I wanted to stain it indigo. No such thing out there it seems. Any tips on how to blend my own stain? Is oil based a must, or could a water based wash work? Thanks!! 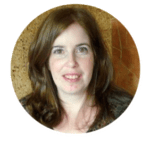 Vibeke – Oh gosh, you can do it, but it’s very complicated and not something you would want to try yourself. Those stains are very tricky to apply evenly and take much much longer. They are water based and very hard to get an even stain. Also, you will need to use a water borne poly. I’d recommend you only use Bona Traffic HD. Thanks for a super quick reply! Yes, realize it may be tricky, but we have ventured into tricky territory before, covering our kitchen floor with record covers and resin. The Bona product looks great. We have a gallon of the Pro Finisher by Parks Water Based Poly already, but you’d choose the Bona over that? Thanks again!! Read your advice in the link. Will get the Bona! Thanks! Hi, I’m moving into a new house and the wood is like a yellowish beigh colour and I was wondering if I can get it to a grey colour. If not a black? Shina – Most likely, yes you can. This of course assumes you have solid hardwood and can refinish your floors. Once you sand the floors down, you are starting with raw hardwood and can do whatever color you want. And, yes, you can go darker. You’ll need to test the stain colors to find the one you prefer. And, if you have a wood other than oak (e.g. maple, pine, etc. ), then you may need to add a conditioner. I have a light oak wood floor in my living room. it was finished by a professional and looks great. now the next room has, what I think, a pine floor. it was stripped once before and poly’d and it has an orange hew to it. I just stripped it again and was wondering if light oak stain will give me what i’m looking for, a match to my living room floor. any help would be great. Jim – First, since these species are different, they will never look the same. Pine is naturally a bit darker, yellower and more orangy. Yes, you can try some different stains to bring the colors color together, but it won’t be exact. It’s hard for me to advise you on stains as I don’t know what stain you have on the oak. And, the stains come out different on oak than on pine. You just have to look at the light stain choices and test them on the wood. You could try golden oak, natural (the stain color), ipswich pine, puritan pine, etc. There are a few others as well. Look at the stain colors and start by seeing what you think is closest but then try to account for the pine being more orangy, so a less orangy stain is better. This is great website! A quick question….can I sand and change the stain of my orange-y oak floor to a grey-ish (on the light side) restoration hardware looking weathered wood stain? Or is that too light? Alison – Yes, you can sand your orangy floor and change the color. It’s done all the time! However, if you have red oak hardwood (rather than white oak hardwood), it will be more challenging to do a gray, especially a light gray, so you may need to do a darker gray or else bleach the floors first. The orange is probably due to the stain, not the species. See my article on how to refinish gray floors (I’m having problems w/ my connection right now…but I believe there’s a picture w/ a link to the article on the lower right in the side bar. Or else go to the search bar (which is in the right side bar) and type in gray and it should pop up. Currently have wide planked brazilian cherry hardwood floors, we are moving to a house with standard oak wood. How can I make it look more beautiful, would changing the color help? if yes , what product would i need to change the color? Surbhi – First, be aware that no matter what you do, oak will never look like brazilian cherry. The color, variation between planks and graining are different. Your best bet is to stain it, and then choose a color that you like. If you like reds, then have your installers test some of those and/or mix them. If you don’t like the oak graining, the darker you go, the less the graining will show. If you want dark w/ a bit of red, try royal mahogany. Sarah – With American Cherry, if you want to reduce the red/orange, you’ll need to go darker. Lighter won’t work at all nor will bleaching. I’d try dark walnut as that generally comes out darker on red woods (even darker than ebony and jacobean even though those can come out darker on oak). If that’s not dark enough/too much red showing, then mix in some true black (which is more opaque). I don’t think that gray will work at all with this type of wood. you could try a dark brown w/ a touch of gray, but I doubt it will work well. I would do oil based poly…unless you try some gray in which case use Bona Traffic. But, I doubt you’ll be able to get the gray to show well on this wood. Debbie, you are a wealth of knowledge when it comes to flooring. I’m glad to know I can change the color of my hardwood. I love the look of Brazilian cherry but unfortunately we cannot afford it yet. I think I will try to darken our flooring a little and add some red. Audrey – Thx so much. I’m so glad this is helpful. By the way, you may want to consider oak hardwood flooring. It’s less expensive an gives you more flexibility for stain colors. You can make it lighter or darker or even with a red/cherry stain.